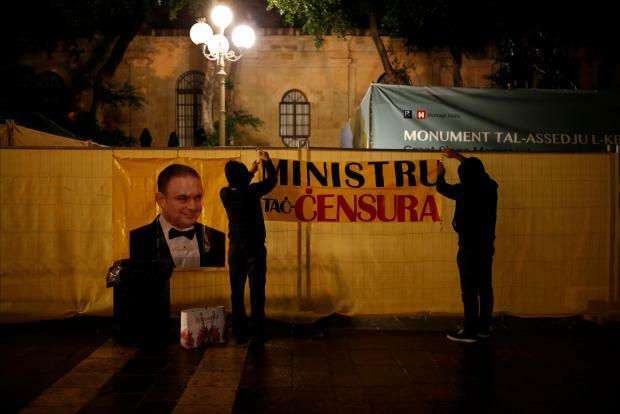 A large poster reading 'Minister of Censorship' and sporting a photo of Justice Minister Owen Bonnici has been stuck to new hoarding surrounding the whole of Great Siege Square. Within hours of the new hoarding being put up, the pressure group Occupy Justice had pinned a new picture of the murdered journalist to it, along with flowers and a candle. Reżistenza activists pinned the minister’s censorship photo to the hoarding later in the day. In a statement, Reżistenza said that when a government used the letter of the law against its spirit, it was the duty of its citizens to stop it from riding roughshod. Dr Bonnici was clearly abusing the power entrusted to him by the people when he insisted on suppressing genuine calls for justice, they said adding that because of his obsession to suppress legitimate calls for justice, he created the Minotaur’s labyrinth. "Bonnici frequently reminds us how much he is against censorship and how many reforms he introduced. However, he didn't think twice before cordoning the monument of the Great Siege in order to stop activists from calling for justice for the assassinated journalist Daphne Caruana Galizia. "We congratulate Minister Bonnici for his new role in the Maltese Cabinet of Ministers: Minister for Censorship." Reżistenza said that with the pitiful excuse of “restoration”, the people were being denied access to one of the most important national monuments. "And what better time can there be for the restoration of a national monument situated in the heart of our capital city than in the middle of the year in which Valletta is the European Capital of Culture?" It noted that the minister had said that the works would be ready in time for Christmas and that once they were completed, activists would no longer be allowed to place flowers and candles in the area, "as if our fundamental rights were his to grant or withdraw". "We find the hoarding an unacceptable, abusive and extreme measure taken by the government in an attempt to hinder freedom of assembly and expression. This would be acceptable in Putin’s Russia but not in an EU member state. The government is resorting to fascist tactics because the truth remains unbearable," the group said. On Facebook, the minister replied that "according to some people who believe in the rule of law", to look after national monuments and ensure that everyone following the law was censorship. Reżistenza then said the minister had fallen victim to his party's own propaganda. "The restoration timing betrays you. No one believes it was done in good faith, especially the Labour supporters who are happy that the minister is stopping the activists’ call for justice. "What Nemstov Bridge is to Russia; the Great Siege monument is to those seeking justice in Malta. Enough of your spin, such a Fool of Law." Activists have repeatedly complained that the government is denying them the right of expression when it repeatedly sends its workers to clear up the memorial. Activists had also unfurled a banner of Ms Caruana Galizia across the hoarding but this was again removed.